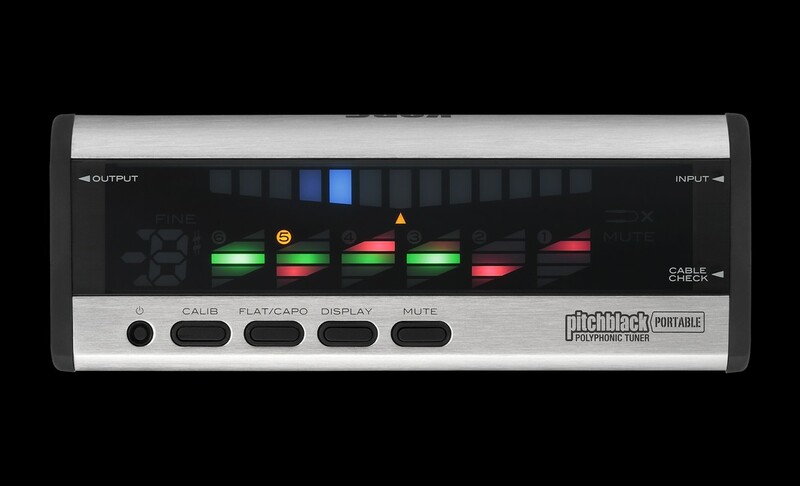 The Pitchblack Portable is a guitar/bass polyphonic tuner that provides speedy and accurate tuning. 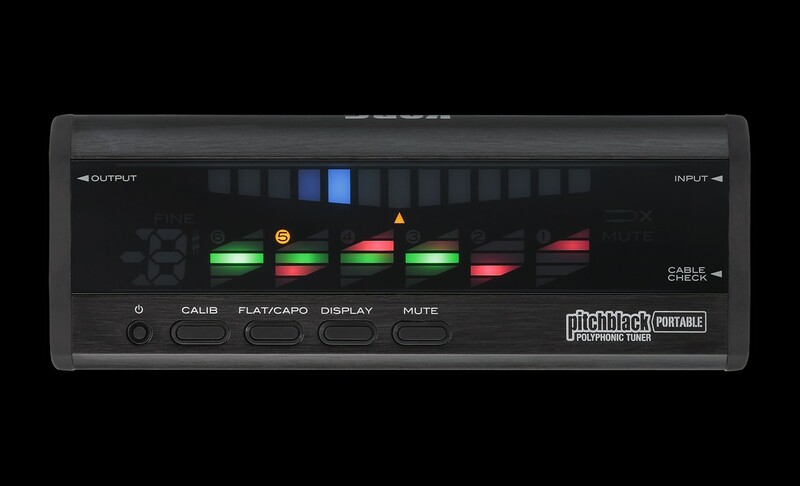 The Pitchblack Portable features a high-brightness LED display which provides excellent visibility, so that the pitch drift of each string is instantly and clearly visible. Korg’s proprietary cable checker function is also built-in, letting you easily check for broken cables; making this unit the ideal choice for stage or studio use. 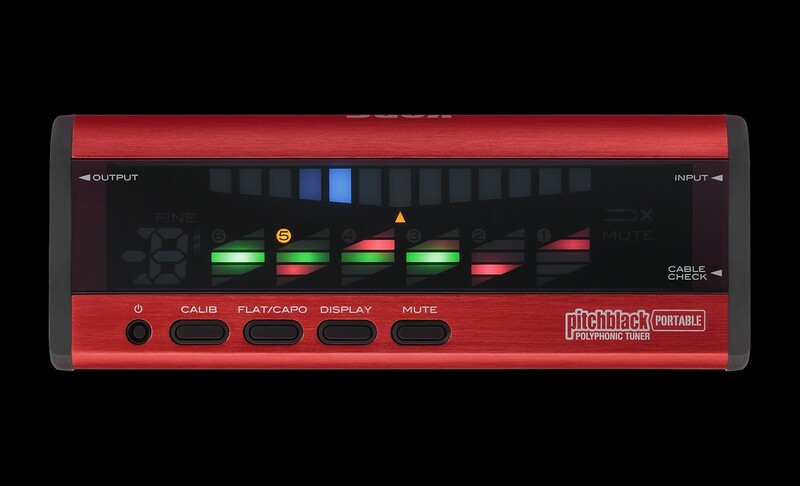 The Pitchblack portable lineup gives you a choice of three models: aluminum black, aluminum red, and aluminum silver. With an accuracy of +/-0,1 cents, the Pitchblack Portable delivers a significant advance in guitar/bass tuning. The large 150 mm wide display draws the player’s attention with its gentle curves, and the colorful high-brightness LEDs provide excellent visibility. Whether it’s placed by your feet, on top of your amp, or on a dimly-lit stage, the Pitchblack Portable delivers superb visibility in any situation. This tuner features the same newly-developed polyphonic tuning functionality as found on the Pitchblack Poly. 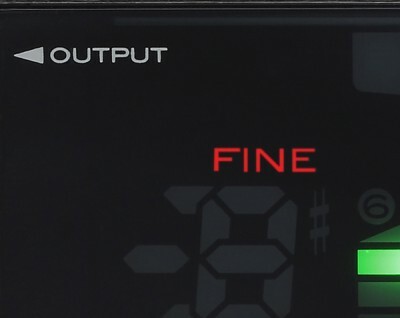 Play all open strings at once*, and the polyphonic meter (green/red) in the lower part of the unit will illuminate, showing you at a glance which strings require tuning. Just tune the strings that require tuning. (If all strings are perfectly in tune, you’ll see a horizontal line of green LEDs.) With all open strings ringing out, turning the tuning peg of any string will cause the “String Seeker” function to automatically detect that string. The large meter (white/blue) found on the upper part of the unit will instantly zoom-in to show the tuning status so you can quickly and accurately tune the required string. 1. Regular Meter mode As when using a needle-type meter tuner, tune the string so that the white LED in the center of the meter is lit. The illuminated LED will move to the right if the string is sharp, or toward the left if the string is flat. 2. Strobe Meter mode Tune the string so that the LED meter illumination stops flowing. The illumination will flow from left to right if the string is sharp, or from right to left if the string is flat. 3. Half Strobe Meter mode Tune the string so that the LED meter illumination stops flowing and only the center white LED is illuminated. The right side of the LED meter will strobe if the string is sharp; the left side if the string is flat. When the pitch is correct, only the center LED will be lit up. Korg’s proprietary functionality will automatically detect whether the input signal is a guitar or bass (4-6 basses are supported). 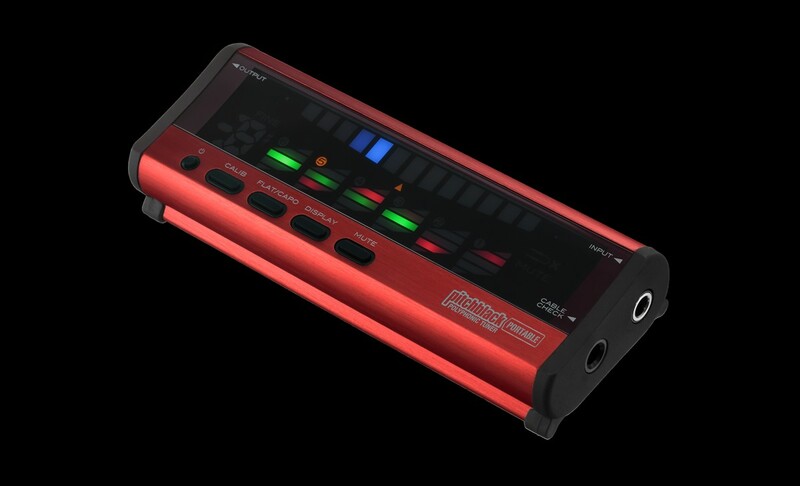 In addition to regular tuning, it’s also easy to choose alternative tunings such as flat, capo, or drop-D.
Korg’s revolutionary Cable Checker function is built into the Pitchblack Portable; simply connect the two ends of your monaural phone cable to the INPUT jack and the CABLE CHECK jack, and the display will tell you whether the cable is broken. This is a convenient way to avoid problems on stage or in the studio. 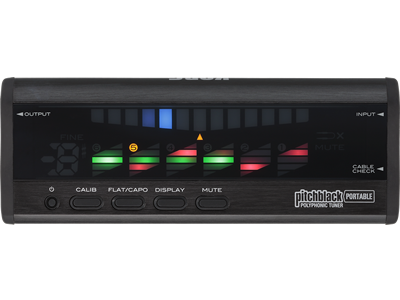 The Pitchblack Portable is designed with a buffered output to minimize any change or additional noise in the audio input signal. 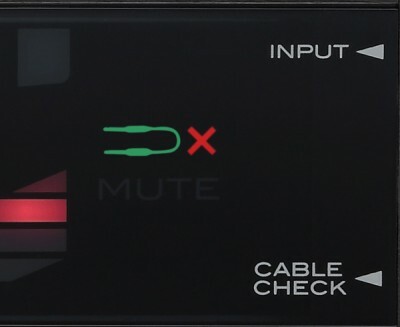 There’s also a Mute function that lets you tune without producing sound from the OUTPUT jack, which is a real convenience for live performances. 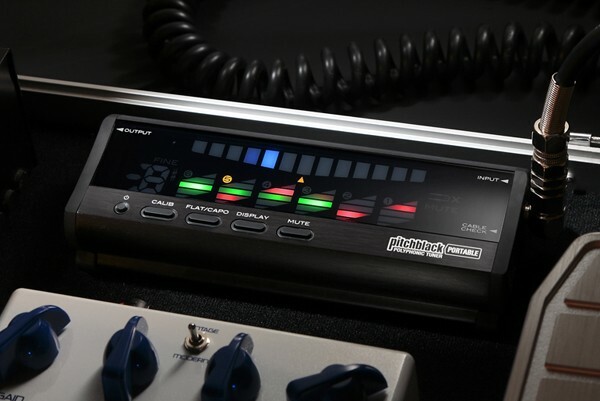 The Pitchblack Portable is sized like a pedal effect unit, and will conveniently fit into most effect pedalboard systems. 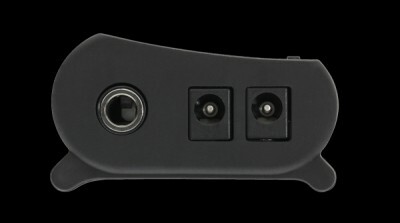 In addition, the Pitchblack Portable also provides a DC OUT jack that can be used to feed power to other effect pedals (when using the optional AC adapter). With a dedicated power supply circuit for the DC OUT, this jack is able to provide a stable and noiseless power supply (9V 200mA) that’s equivalent to a dedicated effect pedal power supply. By connecting a commercially available DC cable, you can supply power to multiple effect pedals, allowing you to simplify the power connections in your pedalboard.